‘Earth tubes’ will be used to ‘precondition’ the air so as to slash air-con costs by as much as 70% at Spaceport America, which has just broken ground in southern New Mexico. ‘Earth tubes’ are more commonly known as ground-coupled heat exchangers. They use the earth’s near-constant subterranean temperature to warm or cool air for residential to industrial applications. This is touted as a cost-effective option to traditional cooling or heat pump systems, as it involves no compressors or even chemicals. The only requirement is blowers to move the air. Spaceport America, the world’s first purpose-built commercial spaceport for Virgin Galactic, is a 110,000 square-foot hangar facility that will employ cutting-edge green building practice. The terminal hangar building will comply with US Green Building Council LEED regulations. Extensive use of sustainable and clean energy technologies throughout the design will ensure that the facility sets the benchmark for similar future structures. This includes the use of ‘earth tubes’, as well as solar thermal panels on the roof for hot water, as well as an embedded in-floor loop system. 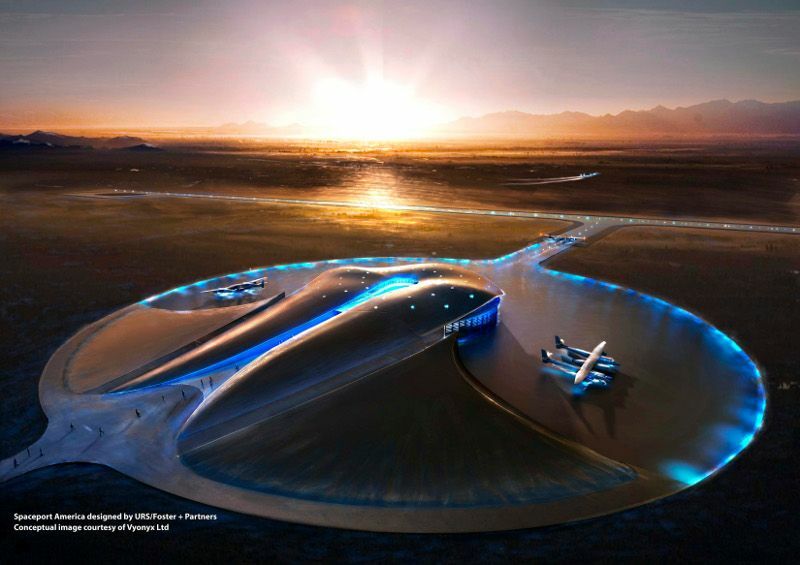 The design for Spaceport America’s terminal hangar building was created by a team of US and UK architects selected after competing in an international design competition. URS Corporation, one of the world’s largest design and engineering firms, teamed with lead designer Foster + Partners of the UK to submit the winning design. In the Middle East, Foster + Partners is involved with the Abu Dhabi World Trade Centre at Al Raha Beach. External air is drawn in from a filtered air intake (a MERV 8+ filter is recommended). The cooling tubes are typically 100 foot long. An open system combined with energy recovery ventilation ensures optimal efficiency. External air is blown through a U-shaped loop of typically 100 to 500 feet of tube, in which it is moderated to near earth temperature before being distributed via ductwork. A closed loop is more effective than an open system, especially with air-temperature extremes, as it cools and recools the same air. This can be constructed with dampers permitting either closed or open operation, depending on fresh air ventilation requirements.